Sometimes it’s great to just hit the road with no plan whatsoever. 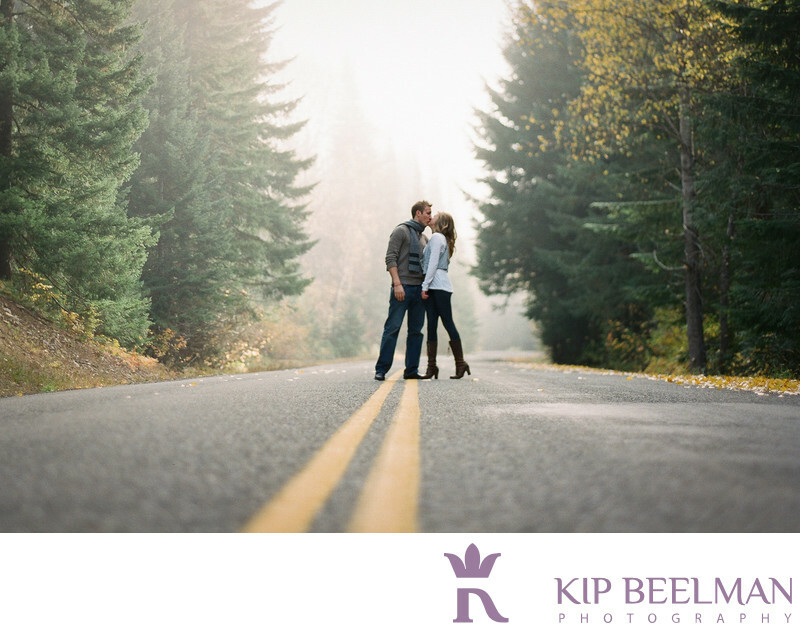 We met at a Starbucks poised at the foothills of the Cascade Mountains one crisp October morning and just pointed the car east with no rules - We just chased good light, fog, fall foliage and fun. There’s nothing quite as exciting as just turning down a road you’ve never been down to see what you find. We explored the back roads of North Bend, ventured further to Alpental at Snoqualmie Pass, on to Lake Easton and finally got lunch at The Brick - A tavern in Roslyn, WA made famous by the 90’s sitcom Northern Exposure. These two shared some pints and chili cheese fries while I had, um… A really satisfying salad. Digital is the best tool for the majority of the documentary wedding photography that I do, but for this engagement session it was all about Fuji 400h and Kodak Tri-X while I used the medium format lusciousness of a Contax 645 with gorgeous Zeiss f/2 lens in addition to my Hasselblad 500 c/m with Zeiss 80mm f/2.8. Dat Zeiss glass yo. Moments before we made this frame we were zooming down I-90 at about 70mph and decided to take an exit on an unknown road. A moment later we were rounding a bend that unfolded this scene of a lonely mountain road complete with fall colors and fog. With a stage like that, they merely needed to show the most basic interest in one another to result in this beautiful engagement photo. Location: NFD Road 58, North Bend, WA 98045. Keywords: Engagement (39), North Bend (6).